If you’ve landed on this post, then you may be someone who has noticed that you have one hip that is raised higher than the other? Or alternatively, that you have one leg longer than the other? Is it your longer leg that is causing you to have uneven hips, or did you just happen to be born with uneven hips? These are some causes you may want to consider but the most realistic option is that you have a lateral pelvic tilt where one hip is ‘hiked’ up higher than the other due to certain muscles imbalances that exist in the body. Our bodies aren’t all perfectly symmetrical and everyone has some asymmetry to some degree due to how we hold and use our bodies throughout our lives. This asymmetry is expected and perfectly normal. However, there can be times where a little too much asymmetry, such as in the case of a lateral pelvic tilt, can leave us more prone to injury, reduce mobility and negatively affect our overall physical performance. If you think that you have a lateral pelvic tilt you will want to take action to fix it as soon as possible. The good thing is that in most cases a lateral pelvic tilt can be fixed through basic self-massage, stretching, and corrective exercises that anyone can do from their own home. In this article, we’ll take a look into learning more about the lateral pelvic tilt. We’ll explore how this condition develops, how it’s treated, and what you can do to correct it. We’ve also laid out a cool infographic at the end of this post which summarises all the main points of this post. What is a Lateral Pelvic Tilt? As its name suggests, a lateral pelvic tilt (LPT) is a common postural misalignment characterized by the tilting of the pelvis to one side. Individuals with this condition will appear to have unbalanced hips, with one side sitting lower than the other. There are several known causes of a lateral pelvic tilt, including scoliosis and leg length discrepancy, but one of the most common culprits of this postural discrepancy is poor posture. In order to understand how improper posture contributes to a lateral pelvic tilt, it’s important to consider how the pelvis is structured. The pelvic bone sits at the top of the thigh bones (femurs) and is supported by a network of muscles that help stabilize the hips and allow for a full range of movement of the legs. When a muscle imbalance occurs between these muscles, whether due to injury, tightness, weakness or overuse, a lateral pelvic tilt may develop. Specifically, a lateral pelvic tilt is the result of the tightening and shortening of the adductors, gluteus medius, and quadratus lumborum on one side of the body, and the simultaneous weakening and lengthening of the same muscles on the opposite side of the body (don’t worry we explain this all in more detail later!). Other than one hip being higher than the other, the presence of a lateral pelvic tilt can result in a drastic chain effect which reverberates up and down the body. The most obvious symptom of a lateral pelvic tilt is having an uneven walk or gait due to one hip dropping lower than the other. From the image above, you will see how the hip which is higher will usually result in the shoulder on the same side, being lower than the other side. This can cause someone to believe that they have uneven shoulders when in fact it is not the shoulders that is the issue, but the tilted pelvis. A lateral pelvic tilt is often confused with another condition known as leg length discrepancy. Someone with a lateral pelvic tilt may think they have one leg longer than the other, or one leg shorter than the other. However, this is a myth as it is the tilt in the pelvis which makes it feel like the hip that is lower down is longer because the other leg doesn’t reach the ground when you stand. While in some cases, one leg may actually be longer than the other, most cases of leg length discrepancy are caused by a muscle imbalance. In fact, it is estimated that fewer than 30 per cent of leg length discrepancy cases can be attributed to anatomical leg length difference (“true” leg length). The majority of leg length discrepancy cases are considered to be functional – that is, the difference in leg length is due to lifestyle factors such as improper walking, standing, running, or sitting. The best way to rule out a true leg length difference is to measure both legs. If you do have a true leg length discrepancy, then it is unlikely that these exercises in this post will be of any benefit and in which case you should seek professional help. You can see from the diagram that the bones of the leg usually rotate internally as a result of a lateral pelvic tilt. What’s not to be ruled out is that the internal rotation of the leg could also be the cause of the lateral pelvic tilt, rather than the result. If it is the cause, then the problem starts all the way down at the foot. Typically, one foot will be pronated where the ankle is rolled inward, this could be a flat foot or a collapsed arch. When one foot becomes pronated, the shin bones and the femur rotate inward and the hip will drop. While mild to moderate cases of lateral pelvic tilt usually do not produce any noticeable symptoms, severe or longstanding cases of LPT may cause muscle tightness and low back pain. Disc degeneration – Research suggests that lateral pelvic tilt may cause disc degeneration due to the distortion of the lumbothoracic spine. One study found that individuals with a high degree of pelvic tilt also had a higher incidence of disc degeneration within the L4 to L5 segment of the lumbar spine, regardless of age or gender. Disc herniation – Although not directly correlated to lateral pelvic tilt, disc herniation may occur as a secondary effect of disc degeneration. Sacroiliac joint pain – Lateral pelvic tilt can lead to an asymmetrical positioning of the sacrum in relation to the ilia, or “wings”, of the pelvic girdle. This asymmetry may result in sacroiliac joint pain. The good news is that lateral pelvic tilt can be corrected if diagnosed early enough. In later sections, we’ll explore a few treatment options for lateral pelvic tilt, and provide you with a few simple exercises that can be done at home to correct this common postural imbalance. The main test to check if you have a lateral pelvic tilt is to stand in front of a mirror and place a finger on either side of your hip bone. If one finger is higher than the other, then it’s likely that you do have a lateral pelvic tilt. Of course, there is the possibility you may not have a lateral pelvic tilt and that you really do have one leg longer than the other. Although this is rare, you should keep this in mind when testing yourself. In this section we’ll discuss some of the causes of a lateral pelvic tilt. Alternatively if you prefer a more visual experience, you can watch the video below. If you hold your body in the same positions for hours each day, every day, for several months or years, your body’s tissues will adapt to this position. Therefore if you constantly hold your body with one hip hiked up, your body may adapt to that position. We’ll discuss some of these unnatural positions later in the post. A lateral pelvic tilt is frequently seen in individuals who practice poor posture when sitting for long periods of time. Prolonged sitting not only places undue stress on the spinal column, but it also changes how the muscles and ligaments of the lower body (specifically, those that support the pelvis) interact. If not corrected, this muscle imbalance can lead to a negative feedback loop of injury, overcompensation, and re-injury of the muscles and ligaments that stabilize and mobilize the pelvis (1). If you hurt yourself on one side of your body in the past, then it’s possible you may raise one hip higher than the other to avoid pain in that area. In addition, if you’ve had reconstructive surgery on your leg, one leg may have changed length. In all of these situations, you will want to go and see a doctor just to be safe. A flat foot or a collapsed arch on one side will cause the foot to roll inwards. With this inward rolling, the tibia and fibula (muscles of the shin) will internally rotate and the knee will turn inwards. With the inward turn of the knee (knee valgus) the femur also internally rotates and the hip will drop, causing the lateral pelvic tilt. In the next section, we’ll look at some treatment options for a lateral pelvic tilt. If caught in its early stages, a lateral pelvic tilt is a manageable condition that can usually be corrected with chiropractic care, massage, physical therapy, or an individualized treatment plan consisting all three of these therapies. Your physician will determine the right course of treatment for you depending on the severity of your condition. Chiropractors take a holistic approach to correcting a lateral pelvic tilt in order to treat pain and restore a full range of motion to the muscles, ligaments, and joints surrounding the pelvis. A chiropractic treatment plan may include chiropractic adjustment, massage therapy, physical therapy, and stretching. The goal of chiropractic treatment is to bring the body into better balance without the use of medications or injections. Not only can a physical therapist suggest muscle strengthening and stretching exercises that can be done at home to alleviate the discomfort associated with a lateral pelvic tilt, but he or she will also offer advice about managing your condition through lifestyle changes. The goal of physical therapy is to restore symmetry to the pelvic girdle by strengthening weak and/or elongated muscles while stretching tight, constricted muscles. A massage therapist will use a number of manual techniques to relax the muscles that support the pelvis. Massage therapy also helps improve blood flow in the affected area which, in turn, helps reduce inflammation and alleviate pain. Among the techniques used by professional massage therapists are deep tissue massage, myofascial release, and Gua Sha – a traditional Chinese therapy involving the scraping of the skin with a massage tool in order to boost circulation. In this section, we’ll look at a few simple exercises that can be performed at home to correct mild to moderate lateral pelvic tilt. It should be kept in mind that these exercises are not meant to replace professional medical treatment. If you’re experiencing severe pain or limited range of movement due to an asymmetrical pelvis, it’s important to consult with your doctor in order to pinpoint the exact cause of your condition and formulate a treatment plan. There are a couple of angles that can be taken to fix a lateral pelvic tilt. The first is to fix flat feet (if you have them) and the other is to correct any muscle imbalances that may have developed that hold your body in the lateral pelvic tilt position. The final step is to address the bad posture that causes the problem in the first place. If you have flat feet then it could be the main cause of your uneven hips. Fixing flat feet is a problem of its own, and if you have it, your priority should be to fix this rather than the lateral pelvic tilt because the foot is the foundation of the body, and any problem in the feet will affect everything above. By fixing your flat feet first, your shins, knees, thighs and hips should begin to align properly. We already have written a post on how to fix flat feet, so it would be a good idea to read that post and add the exercises on that page to your daily routine. In the meantime, here is a short summary of what fixing your flat foot may look like. If you have a flat foot, the arch of that foot could be tight. A simple fix is to roll a massage ball up and down the arch whilst putting pressure on the ball by standing on it. It is possible to strengthen the arch so that the arch muscles become activated and strong enough to pull the arch back up. Towel crunches – This is where you place a towel on the floor and then place your affected foot at the bottom edge of the towel. You then scrunch up your toes and try to pull the top of the towel towards you without lifting your foot off the ground. Repeat this motion until the whole towel has been pulled down. Pen Penny – This exercise is probably the best one for arch strengthening. This involves placing a coin under the base of the big toe on the affected foot. You would then try to balance on that foot whilst keeping pressure on the penny at the same time. Both these exercises are explained in more detail on this page. Slight modifications of these exercises are shown in the video below. Not everyone responds well to exercises, and the arch could remain flat even after a few months of arch strengthening exercises. If this is the case you may have to opt for shoe inserts to help support the arch. Fixing a flat foot should help the ankle to stop rolling inward and hopefully restore proper alignment in the joints above. It is not a full proof solution, however, as there are likely to be other muscles imbalances that still exist in the legs, particularly the side with the lower hip. If you have uneven hips, it is likely that the muscles in the torso of the hiked hip side are short and tight. If you look at the diagram below, if the muscle that is highlighted red is short and tight, it will pull that side of the pelvis up and towards the rib cage which it is attached to. This chronic tightness will pull one side of the pelvis up, and at the same time pull the shoulder down. So what is this pesky muscle that we need to lengthen? It is the quadratus lumborum. You will need to first release any knots that are causing tightness, followed by stretching techniques on the tight side. If you can begin to create length in the quadratus lumborum, this should help decrease the chronic tightness that pulls the hip up and the shoulder down (for more information, see our in-depth article on how to stretch the quadratus lumborum effectively). 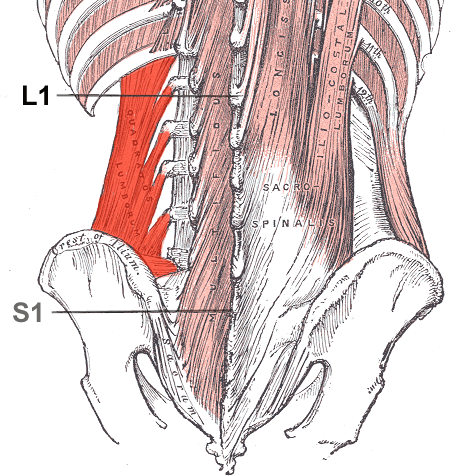 The quadratus lumborum is quite an easy muscle to stretch once you know where it is. Any stretch which involves creating length between the hip and the shoulder of the same side will work. One simple yet effective stretch for the quadratus lumborum is one which is a modification of the classic child’s pose. You can see how to do this stretch, as well as a few other quadratus lumborum stretches in the video below. An additional fix concerning the quadratus lumborum could be to strengthen the opposing quadratus lumborum which could be too weak. By strengthening the weak side (the side with the lower hip), the quadratus lumborum may become stronger and pull up the lower hip slightly. There is a small section on how to strengthen the weak quadratus lumborum on the page mentioned above. Aside from the steps mentioned above, there are some additional corrective exercises and stretches that may be worth a closer look if the above fixes do not work. These additional tips target the glute medius and the adductor muscles. Firstly the glute medius is a muscle of the glute that sits to the side of your main glute, the glute maximus. When you think of your glute muscles you primarily think of the glute maximus and often forget or unaware that the glute medius even exists. The glute medius is an important muscle to keep healthy because it helps level out the hips. When you have a lateral pelvic tilt caused by bad posture, there’s a great chance that your glute medius muscles may have become imbalanced i.e. one may have become too tight and strong, compared to the other which is too long and weak. The same goes for the adductors muscles, which are the muscles which run up and down your inner thigh. A similar imbalance in these muscles can also contribute to a lateral pelvic tilt. In particular, on the side where the hip is higher, the glute medius muscle is likely to be weak and the adductors too tight. Whilst on the lower hip side, the glute medius will be tight and the adductors too weak. As a general rule, you will want to ensure proper care of these muscles through adequate stretching and strengthening of both these muscles to keep them well balanced and to have healthy hips. Below are various stretches and strengthening exercises for both the glute medius and adductors. You will have to work out on your own which sides are tight and need to be loosened, and which sides are weak and need to be strengthened. The video above shows two glute medius stretches you can try out for yourself. The stretches you’ll learn is the pigeon stretch and the lying hip stretch. This video teaches you how to strengthen the glute medius. Side lying leg raises are an effective way to get your glute medius muscles firing. If you feel you want to try out more exercises, then check out our article on how to strengthen weak glute medius muscles. The video above shows you a simple stretch to help lengthen your adductors. For more adductor stretches check out our post on how to stretch the adductors. If you’ve identified your weak adductor you can try the exercises above to strengthen it and hopefully balance out your hips. All these corrective exercises and stretches won’t be of any use if you don’t eliminate the times when you intentionally, or unintentionally raise one hip higher than the other. Your body tissues will adapt to the positions in which you hold them for long periods of time, therefore you want to avoid putting the quadratus lumborum in a shortened position. To begin fixing your posture habits you will have to first become aware of the times throughout your day when you may hike one hip higher than the other. Aside from cases involving scoliosis, most instances of lateral pelvic tilt can be avoided by making a few simple lifestyle changes. Below are a few simple tips and things to consider for preventing a lateral pelvic tilt from developing or worsening. Sleeping on your Side – If you have a favourite side you like to sleep on, then the hip that is in the air will be in a ‘hiked up’ position throughout the night. To avoid this it would be preferable to try to sleep on your back. Uneven Sitting – There may be times where you tend to sit with one hip higher than the other. Perhaps you may rest your arm on the window when you are driving unknowingly tilting one of your hips? Or maybe when you are using a computer mouse you tend to lean towards it? In any case, try to maintain a neutral level pelvis when sitting. Standing posture – A lot of times people tend to have a favourite side to lean towards when standing. A further example of this could be when people hold heavy objects close to their bodies and tilt their hips to support the extra weight. A common example could be when a parent is carrying a young child or grocery shopping against their torso. Consider purchasing a kneeling chair – Using a kneeling chair forces the body to maintain a straight spine. Kneeling chairs also can help stretch tight hip flexors. Swap your sitting desk for a standing one – Sitting for long periods of time not only causes the hip flexors to contract, but it can also impede blood flow to the muscles of the lower body. If your work requires a significant amount of time at a desk, consider switching to a standing workstation. Use a chair with lumbar support – An office chair with lumbar support will protect the delicate structures of the lower back and promote better posture overall. If your chair doesn’t have a lumbar support, consider using a lumbar support cushion. If you notice you have a habit of tilting one hip up, then you will need to correct this whenever you find it occurring. By doing this, it gives you a greater chance of fixing your lateral pelvic tilt. Mild to moderate cases of a lateral pelvic tilt can usually be treated without invasive treatments like medications, injections, or surgery. You can try to incorporate the above tips into your lifestyle to improve your lateral pelvic tilt and restore a full range of movement to your hips and legs. However, If you are feeling in any doubt always consult a medical professional before attempting any corrective exercises on your own. Please include attribution to drbodygadget.com with this graphic. Stay up-to-date with our fresh content by receiving customised newsletters about your favourite gadgets, tools and tips! DISCLAIMER: As an Amazon Associate I earn from qualifying purchases.